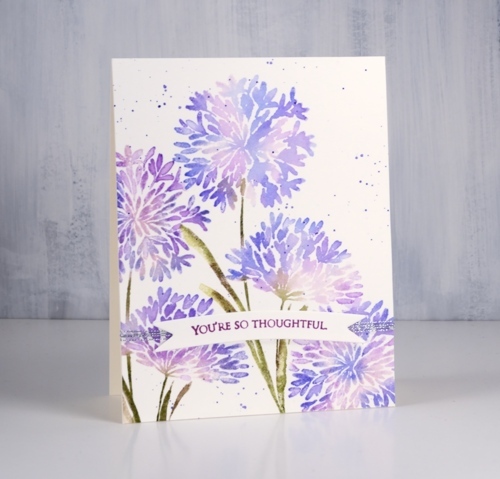 Blue flowers might just be my favourite, so of course I chose blue for some of the new flower stamps from Penny Black. 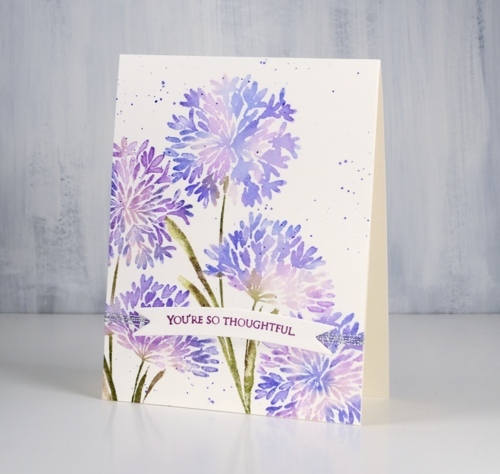 My first card features the ‘Together‘ stamp which is lovely and reminds me of the agapanthus my parents often grew in their flower gardens. Both of today’s cards were made with distress stains either painted on or applied straight from the dauber. 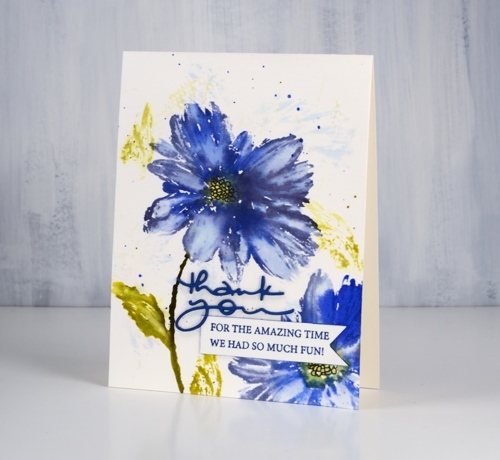 This large blue flower stamp is called ‘Radiant‘. 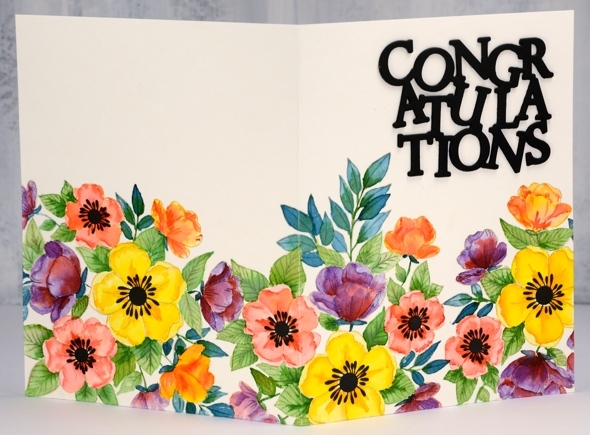 For this card I started by wetting the watercolor panel so when I stamped on it with milled lavender and crushed olive distress inks I would get a diluted abstract print. I dried the panel before putting it in the stamp positioner to work on the bold print. 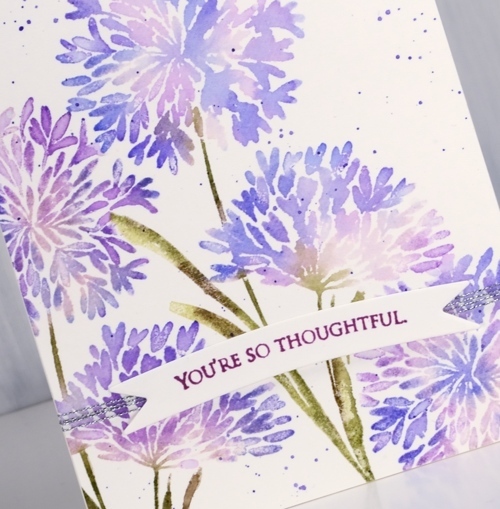 For the bold stamping I used shaded lilac, blueprint sketch, dusty concord, crushed olive and scattered straw stains. Once the stain was dry I drew the centre of the flower with a black marker. People often ask me if distress re-inkers can be used to create the same effects as the stains. I don’t own any re-inkers so I can’t tell you. I think it is probably time I got a few and did some comparisons. Stay tuned. I am trialing a new supply linking system right now which looks and operates a little differently from what I was using. If you click on any of the supplies pictured below you will be taken to a complete list image where another click will take you to the Foiled Fox store. Buying through my affiliate links to the Foiled Fox store does not cost you any extra but earns me a commission. Please let me know if you have any thoughts or concerns with the new system. It is a trial and I am interested to know what you think. I still have a few flowers in my garden but it’s getting sparse in out there. The leaves have started falling but not with any real commitment yet. I chose an autumn colour scheme and kept my paint choices to a minimum. 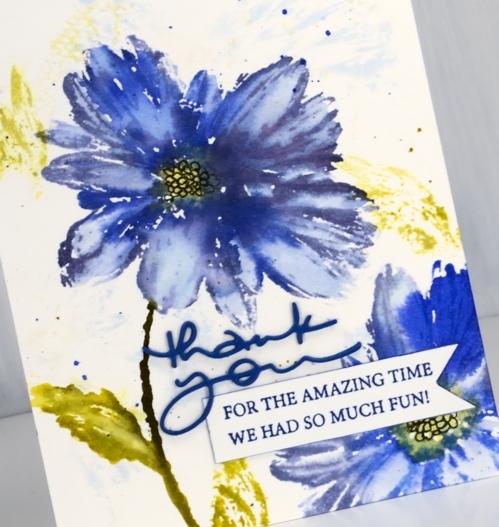 I used brusho ost blue, yellow and crimson brusho and did some mixing to get all the variation you see in the card. 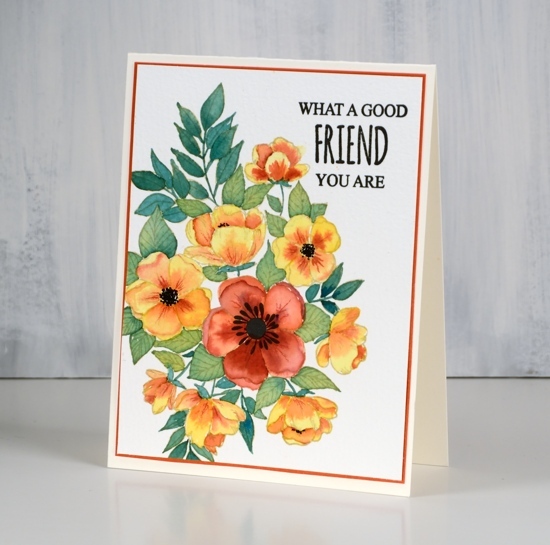 I stamped the large floral image from the PB set ‘radiant’ in antique linen distress ink. It’s a pale water soluble ink which is perfect for watercolouring. 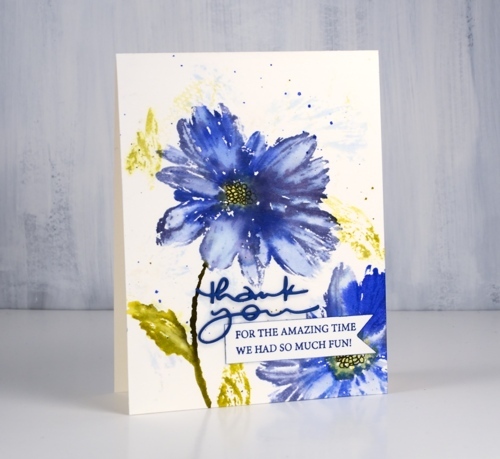 I used a palette with my brusho paints for this card, dropping some brusho into a well then adding water. As I was using a circular palette I left spaces between the crimson, yellow and ost blue paint so I could create mixed colours in the spaces. I painted the small flowers yellow first then while the paint was wet dropped some orange (mixed from crimson and yellow brusho) onto the petals to show detail and shadow. The large flower is painted in a dark mixed orange. The leaves are painted with greens mixed from yellow and ost blue. The stamp set includes solid flower centres to be stamped after painting. I used the large one in the large flower but couldn’t find the smaller one so I dotted black ink with a marker. Later my dad found that tiny missing stamp which made me happy. The sentiment is from the perspective set; I only inked part of it to get the exact wording I wanted. To finish off I matted with a rust cardstock and attached to a natural white card base. Enjoy your weekend. Happy Thanksgiving, my Canadian friends. 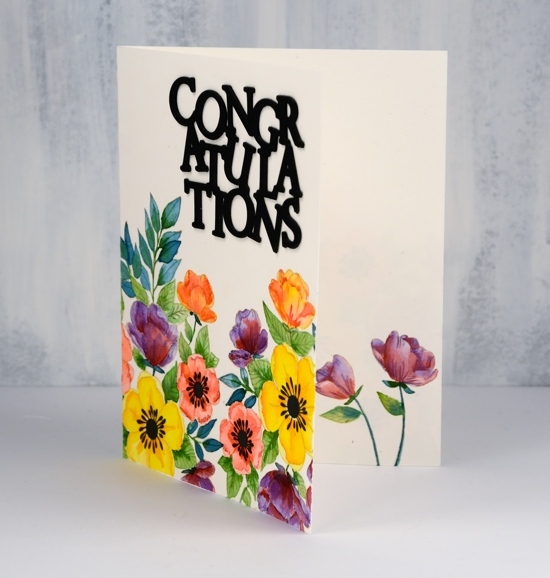 I am sharing floral cards this week here and on the Penny Black blog. This particular one makes me happy. It took me an age to complete but I think it’s bright and sunny. 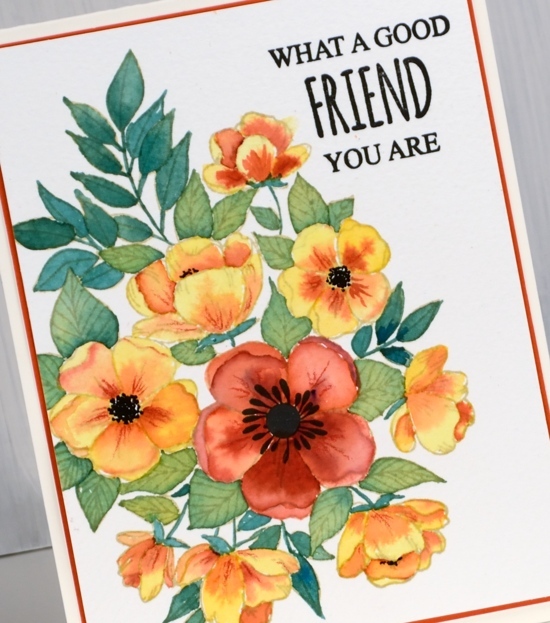 I’ve been wanting to create a card where the design continues across the back and front; my next challenge is one where the design covers back, front and inside! 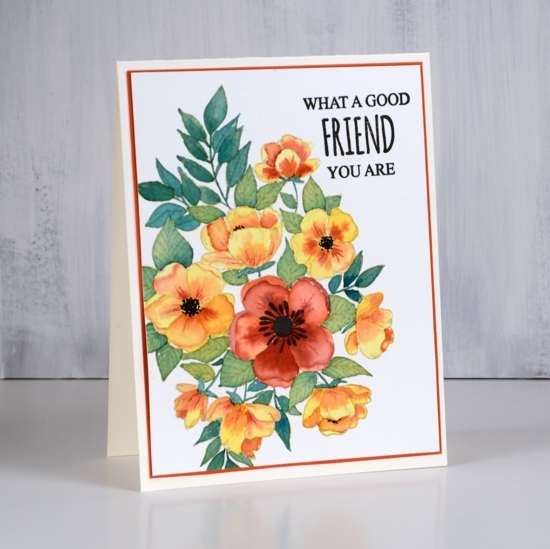 I used the large floral stamp from the transparent set ‘radiant’; it’s part of the new Nature’s Art release from Penny Black. I used my stamping platform and antique linen ink to stamp three prints across the panel. I wanted them to fit nicely together but not look like a repeat pattern so I changed the direction each time. If I had been really diligent I would have masked the first before I stamped the next but I just let them overlap a little. When it came to adding colour I decided which petals or leaves would be in front and painted accordingly. You can’t tell now can you? 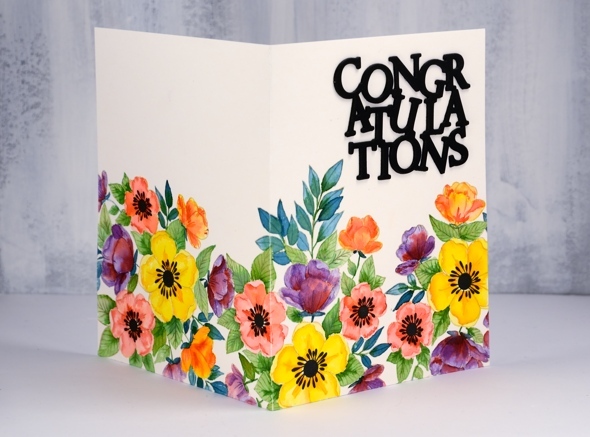 The set includes solid centres in two sizes for the flowers so I stamped them in black and created my die cut stacked sentiment in black also. 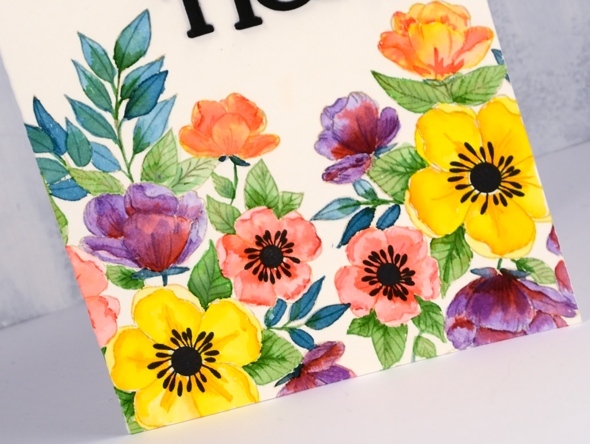 And I almost forgot to mention I stamped and painted a couple of flowers inside too. I’ll be back with more bright and breezy florals tomorrow.